Photo Caption A: Having won its fourth consecutive Hudson Valley Intercollegiate Athletic Conference (HVIAC) Championship on Sunday, February 18, 2018, the Berkeley College Knights Men’s Basketball team advances to the United States Collegiate Athletic Association (USCAA) Division II National Men’s Basketball Tournament. This is the first regional championship under the leadership of Coach Pena (standing, front row, left), who was promoted to Head Coach after serving as the Associate Head Coach for the 2016-2017 season. 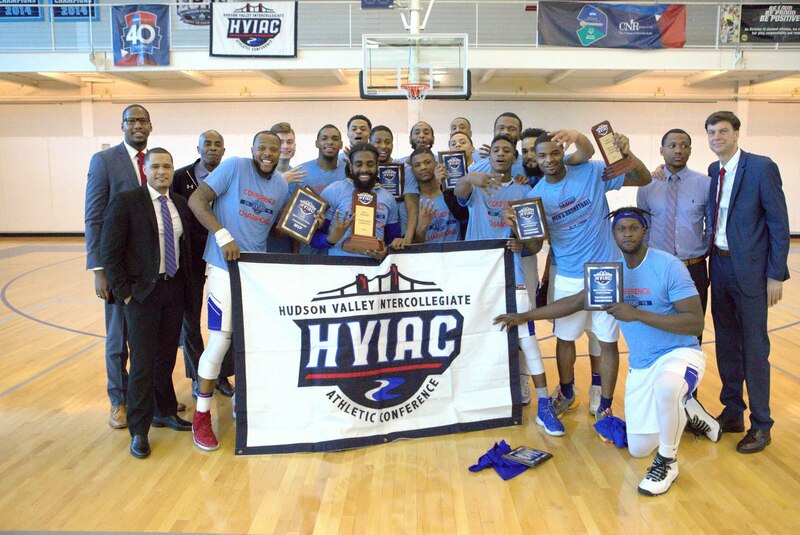 The Berkeley College Knights Men’s Basketball team won its fourth consecutive Hudson Valley Intercollegiate Athletic Conference (HVIAC) Championship and its 10th victory overall in this Conference on Sunday, February 18, 2018. The Knights defeated the Blue Angels of the College of New Rochelle by a score of 93-82 and advanced to the United States Collegiate Athletic Association (USCAA) Division II National Men’s Basketball Tournament. “Our team came into this contest today fully aware that we would be facing a hungry team that would be drawing from the energy of its home crowd, and I felt we did a good job of never letting the environment get to us,” said Jonathan Pena, Berkeley College Head Coach, about the championship game. “Now we’ll shoot toward our final goal of winning another national title. Our job is to be prepared for the challenges that lie ahead,” he added. This is the first regional championship under the leadership of Coach Pena, who was promoted to Head Coach after serving as the Associate Head Coach for the 2016-2017 season. 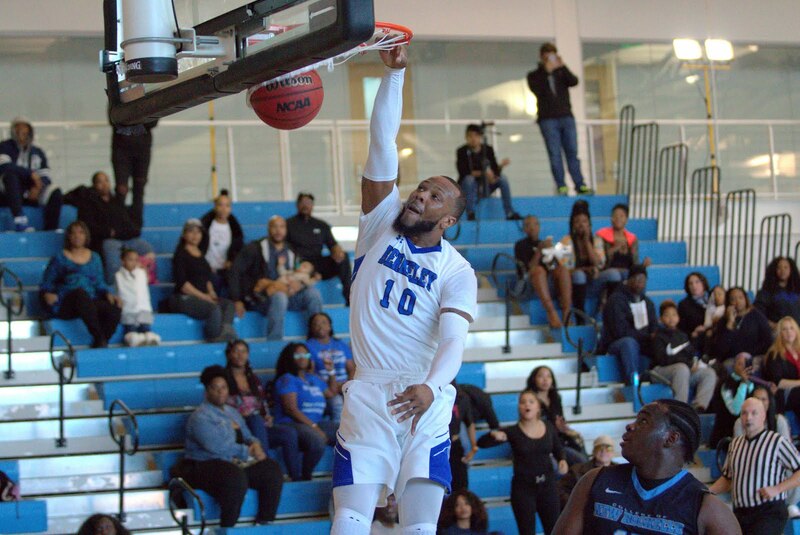 Photo Caption B: Berkeley College scholar-athlete Michael Taylor of Brooklyn, NY, scores a game-high of 31 points during the team’s fourth consecutive Hudson Valley Intercollegiate Athletic Conference Championship on Sunday, February 18, 2018. Mr. Taylor was named Most Valuable Player for the tournament. The stellar shooting of Berkeley College senior Michael Taylor of Brooklyn, NY, led the Knights with a game-high of 31 points; he was named Most Valuable Player for the tournament. Johnnie Green of Brooklyn, NY, with 22 points and a game-high 11 rebounds, and Shamoree Strawn, also of Brooklyn, NY, who played for 16 minutes scoring 10 points and making four rebounds, were other top performers for the Berkeley Knights. For the latest schedule and information about the quest for another USCAA Championship­, visit BerkeleyCollegeKnights.com or TheUSCAA.com.